Student Life - Click on an image below to enlarge. 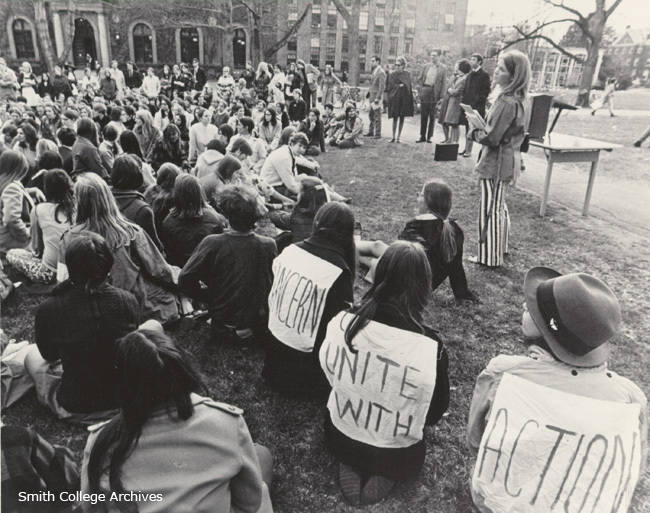 Student demonstration, August 1969. Photographer unknown. 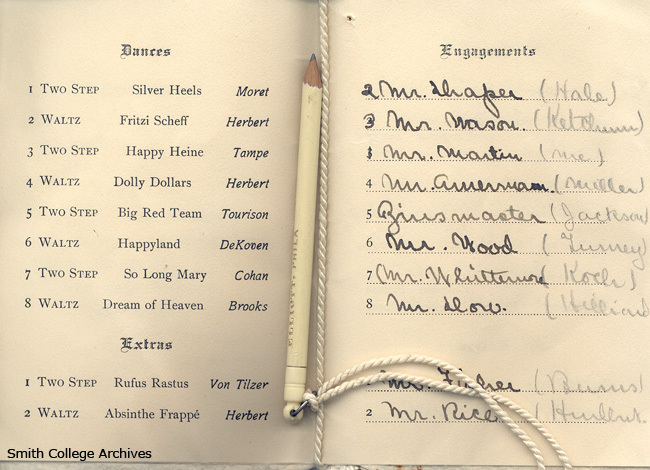 Dance Card for Junior Promenade, Smith College, May 16, 1906. Photographer unknown. 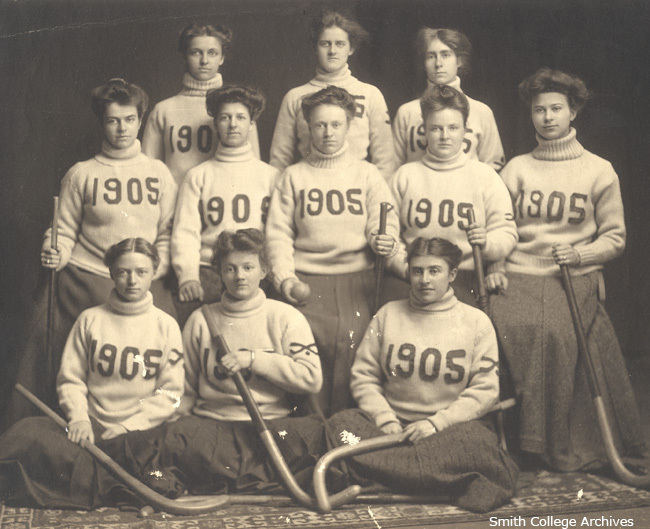 Smith College field hockey team, 1905. Photographer unknown. 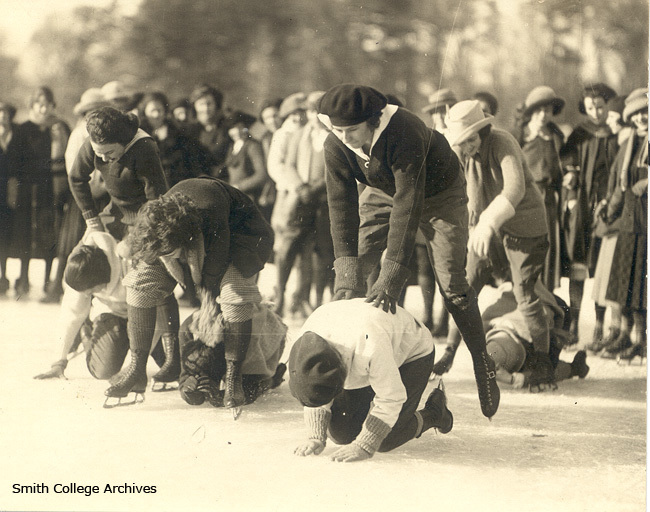 Leapfrogging on ice, class of 1924, Sophmore Carnival in 1922. Photographer unknown. Picnic on Mt. Holyoke, May 17, 1890. Photograph by Charlotte Shrive. 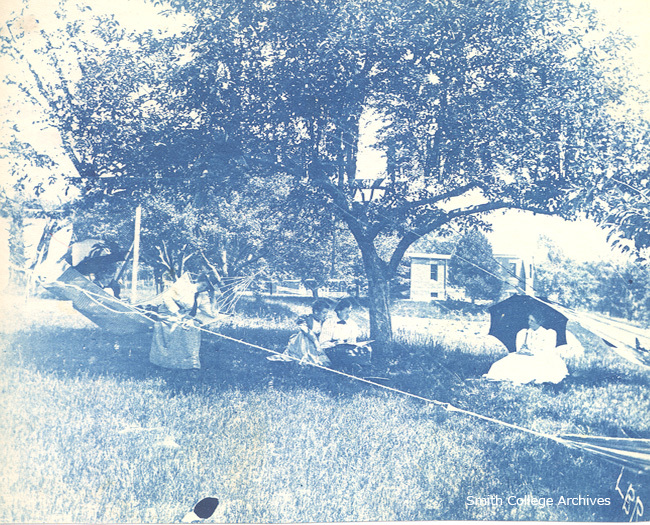 Swinging in orchard at the side of Neilson Library, 1893-94. Photographer unknown. 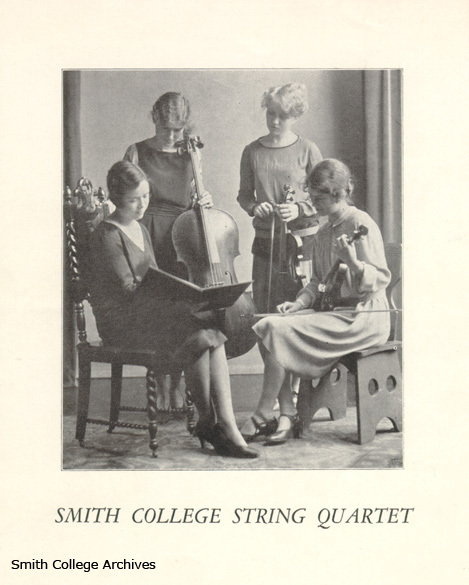 Portrait of Smith College String Quartet classes of '29, '27, and '30. Photographer unknown. 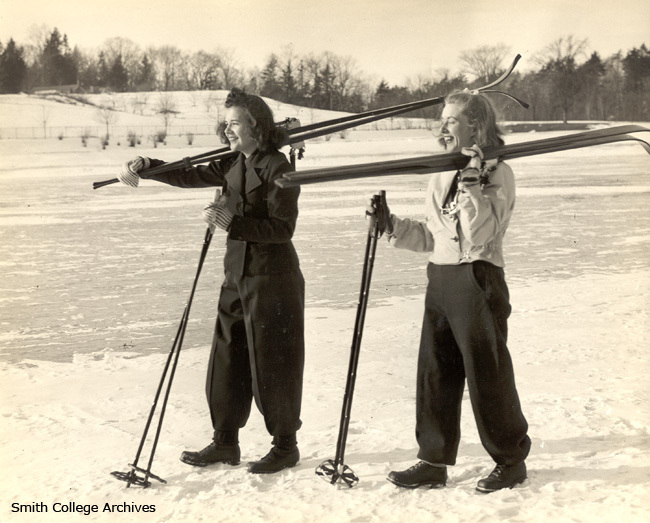 Smith College students skiing, 1940. Photograph by Fred G. Chase, Northampton, Mass. Rope fire drill, circa 1920-1939. Photographer unknown. 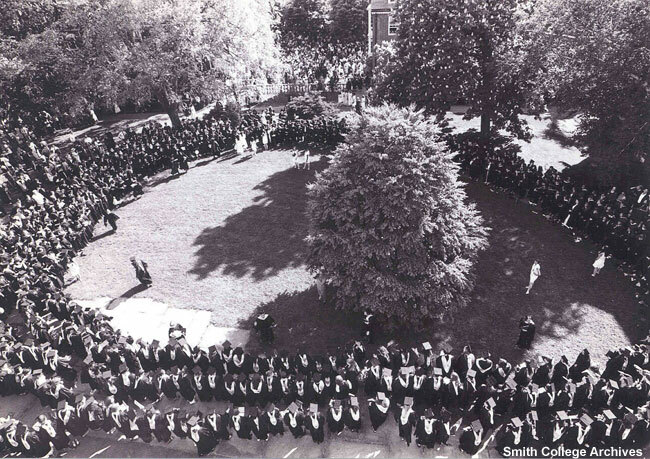 Diploma Circle, Smith College Graduation, 1994. Photographer unknown. 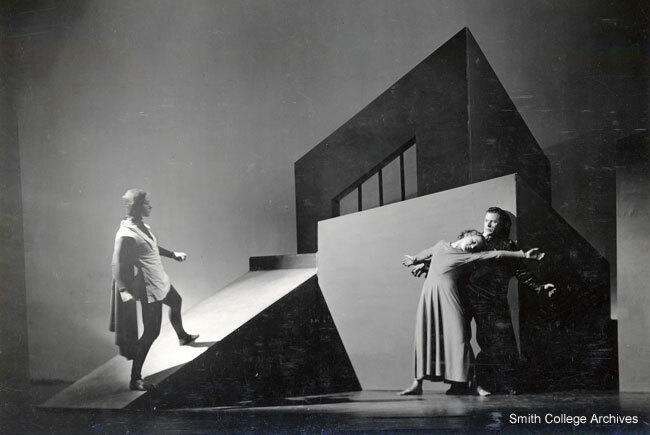 Scene from Man and the Masses a dance drama under the direction of Edith Burnett of the Dept. of Physical Eduction, n.d. Photographer unknown. Park House group, 1925. Photographer unknown. Miss Eastman reading aloud in Haven House, c. 1911. Photographer unknown. Hatfield House, c. 1888. Mary Augusta Jordan, faculty resident at far right; Fanny C. Hesse, Lady in Charge, center. Photo by Epler & Arnold, Saratoga, NY. "A Memorial of exams, essays, metrical travilations [sic] and the like." 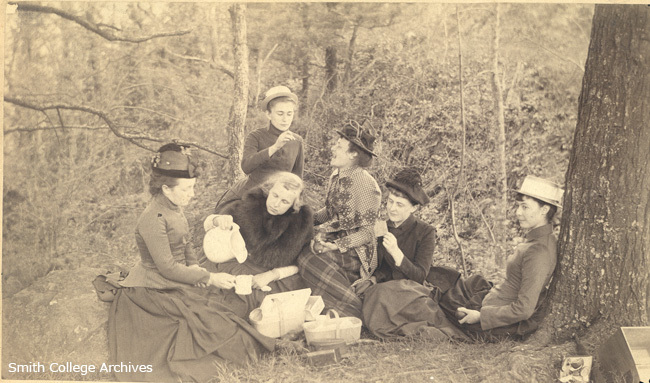 Tea party with Bertha Allen and Helen Lambert, 12 March 1892. Haven House fireside, 1904. Photograph by Kath. E. McClellan. "Ball about to be tossed up at centre" (Senda Berenson holding ball). Illustration for 1903 edition of Basket Ball for Women. Photograph by Kath. E. McClellan. Haven House dining room, 1904. Photograph by Kath. E. McClellan. 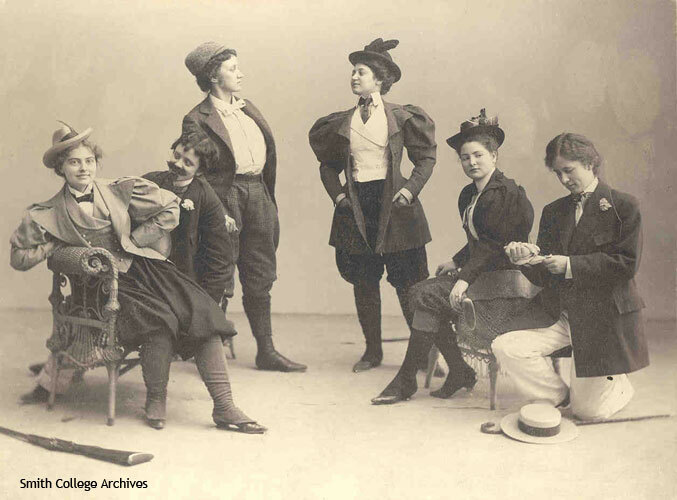 The Amazons dramatics at Dickinson House, 1896. Photographer unknown. 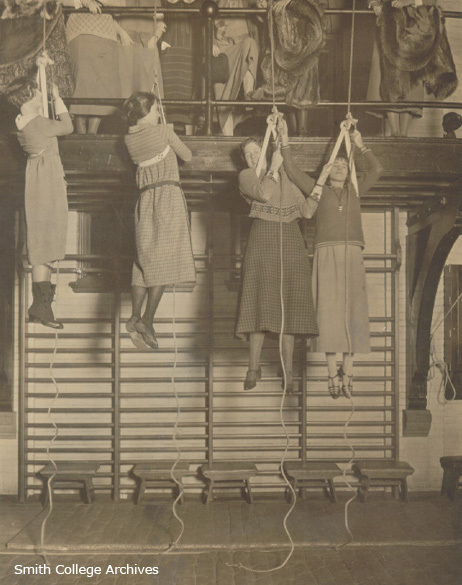 PLEASE NOTE: All images displayed on this page are the property of the Smith College Archives. Publication in any form without the written consent of the college archivist is prohibited.